Revered Ballymoney road racer William Dunlop will be posthumously inducted into the Irish motorcycling Hall of Fame at next week’s Cornmarket Motorbike Awards. 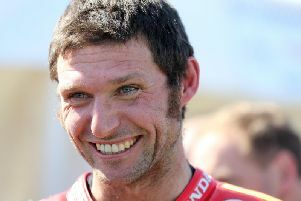 The 32-year-old tragically lost his life in a crash during practice for the Skerries 100 in July last year. Ballymoney's William Dunlop will be inducted into the Hall of Fame at the Cornmarket Motorbike Awards in Belfast. William’s death rocked the sport to its foundations, coming 10 years after his famous father, Robert, was killed whilst competing at the North West 200, and 18 years on from his legendary uncle Joey’s fatal racing accident at Tallinn in Estonia. Joey and Robert are previous inductees to the prestigious Hall of Fame roll of honour at the prestigious awards night, which will take place at the Crowne Plaza Hotel in Belfast on Friday, January 18. His partner, Janine, along with his mother, Louise, will accept the accolade on his behalf. It will no doubt be a difficult and emotionally charged night for William’s family and friends, but Louise says she will be honoured to collect the award on her late son’s behalf. William Dunlop was one of Northern Ireland's top road racers. The 32-year-old was killed in a crash at the Skerries 100 in July 2018. “We are still in complete shock after the tragic incident last summer, but any award the Dunlop family has ever received has been very special,” Louise said. “There is a sad poignancy that William goes into the Hall of Fame alongside his dad and uncle Joey, who we all still miss dearly. The Dunlops’ achievements, which span almost 50 years, have left an indelible mark on sport in Northern Ireland. Louise also wished to thank everyone who has supported the family in the wake of William’s untimely passing, and said she had been ‘overwhelmed’ by the kindness of well-wishers. Regarded as one of the smoothest and safest riders by his rivals on the track, the unassuming County Antrim man was also held in the highest regard away from the Irish racing paddocks. Throughout his career, he won 108 Irish National road races and also triumphed under the international spotlight at the North West 200 and Ulster Grand Prix. William joins many of Ireland’s finest riders in the Hall of Fame alongside Joey and Robert, including Brian Reid, Phillip McCallen, Steve Cull, Johnny Rea, Eddie Laycock, Alan Irwin and leading motocross rider Gordon Crockard. In all, a dozen awards will be presented on the evening, including the main Cornmarket Irish Motorcyclist of the Year title, IFS Road Racer of the Year, Blackhorse Best Short Circuit Rider on UK and Ireland Circuits, JWA Team of the Year, RPS Hall of Fame, Greenlight Television Special Recognition, and Bet McClean Race of the Year. Four-time World Superbike champion is a massive favourite to be crowned Irish Motorcyclist of the Year once again. Rea will be in attendance at the event along with fellow top riders including British Superstock 1000 champion Keith Farmer, British Supersport champion Jack Kennedy, and young British Junior Supersport champion Eunan McGlinchey. Eugene Laverty, who will compete on the new Ducati V4 this season for Team Go Eleven in the World Superbike Championship, is also among the special guests for the sold-out gala evening.